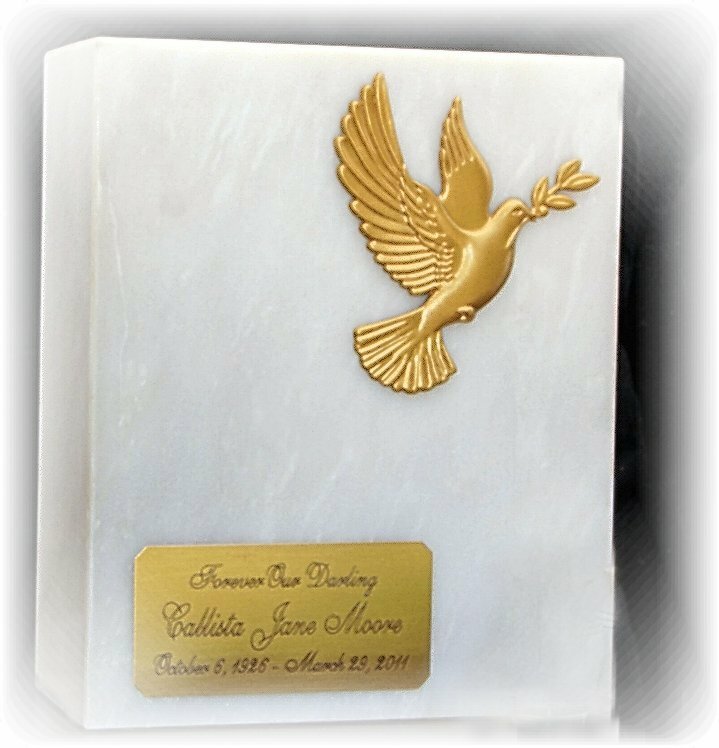 This discreet and elegant cremation urn is genuine white marble with a dimensional gold colored dove and an engraved nameplate as shown (see closeup of nameplate below). It is fabricated to fit in a niche or on a bookshelf. Slightly oversized at 320 cubic inch capacity means it will hold a person who weighed up to 320 pounds, although it is often purchased as a double urn for 2 persons weighing a combined total of 320 pounds or less. The price includes the name plate with 3 lines of engraving. You may call us with engraving details or if you prefer not to call enter the words you want under your email address in the "engraving" section when you checkout. SHIPPING INFORMATION - When you place your order you will receive an email within a few hours with your tracking information - we ship the same day you order! UPS Ground shipping is fast and free.